Corporate America has a plan for you. and lay it on the line to preserve the "American Way of Life." Challenging the Pentagon or Big Oil is not something we can do quickly or easily. down right now, as in today, one person at a time. Consumers are also generally distracted by all the other things on food labels that they're supposed to be concerned about. And when they are exposed to information on GMOs, it's usually from a mainstream source featuring "philanthropist" Bill Gates beaming a smile while expounding the "benefits" that GMOs bring to starving people. The things you are about to read about below are truly bizarre. In recent years, science has really �pushed the envelope� and scientists all over the planet are quite eager to push it even farther. 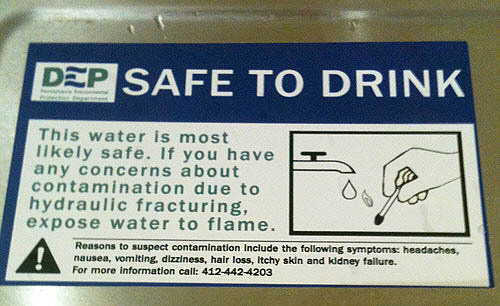 FOIA documents reveal how "large number of workers have been falling victim to cancer, strokes and heart disease"
Conspiracy Theory With Jesse Ventura: BP Oil Disaster "Full Episode"
Prank signs on rest area drinking fountains target gas drilling. A professionally printed sign bearing the banner message "SAFE TO DRINK"
obvious. But something didn't look right to Tonya Markiewicz. Quantitative easing or social engineering? Oil - or something else? Swedes aren�t dumb, and voted in a national referendum to shut down and decommission all their nuclear energy reactors by 2010. "The anti-nuclear watchdog group Concerned Citizens for Nuclear Safety said the fire appeared to be about 3 1/2 miles from a dumpsite where as many as 30,000 55-gallon drums of plutonium-contaminated waste were stored in fabric tents above ground. The group said the drums were awaiting transport to a low-level radiation dump site in southern New Mexico." US: Two Nebraska nuclear reactors may be in danger of damage from the Mississippi River floods. Some experts fear a meltdown could be America's Fukushima, while others say everything is under control. Water expected to rise further ... Gee, what do you think this means? Now, is it "just me" ... or is something wrong with this picture? Ft Calhoun: 100% chance core damage at 1010 ft.. Now 1007 Rising. Photos of the flooding at the Fort Calhoun Nuclear Power Plant. KKR to Buy Top ISP Domain Reg. �Go Daddy�- But who is KKR? Texans outraged by repeated attempts on behalf of state representatives working in consort with the federal government to kill legislation that would ban invasive TSA groping are set to launch a �citizen filibuster� that seeks to pressure public servants into following the will of the people. https://www.facebook.com/event.php?eid=129115517169132 PsyTrance Full Power Thursdays (every last Thursday of the month) Thur Jun 30 9pm-21m $10 Retox Lounge628 20th St SF @ 3rd St.